On Saturday night, Broncos Stadium will have a whole new look as the Monster Energy AMA Supercross roars into town. 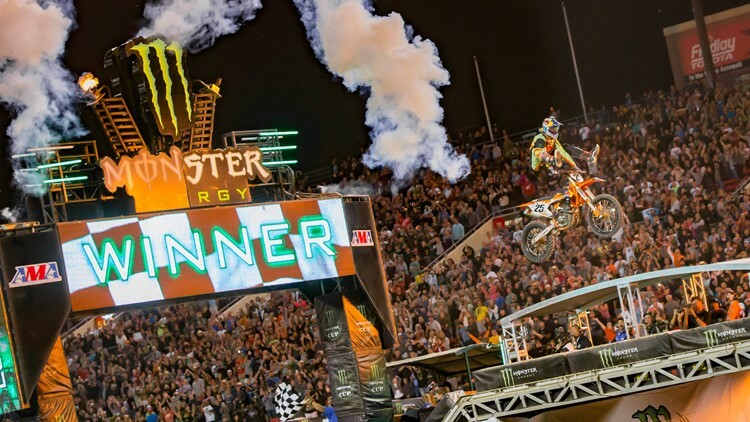 DENVER — Monster Energy AMA Supercross is the premier off-road motorcycle racing series, and it's coming to Denver this weekend. The series, which has been performing at stadiums across the country this winter and spring, comes to Broncos Stadium at Mile High on Saturday. Supercross attracts an average of 50,000 fans at each round, according to event organizers Feld Entertainment, Inc. Fans can see the riders, teams and bikes up close at the Monster Energy Fan Fest beginning at 11 a.m. FanFest will include live music, experiential activations, autographs sessions, and a Supercross Virtual Reality experience. Opening ceremonies will begin at 5 p.m. with the first heat races beginning at 5:30 p.m. The race will also air on NBC Sports Network. Tickets start at $20. Coming off a win last week in Nashville, Colorado's own Eli Tomac will hit the track in 2nd place in the overall points standings. He stopped by 9NEWS on Thursday to talk about the event. You can watch an interview with him in the video below.